So that's my first hint -- this movie location is not in California (I'm on vacation this week). Second clue: I'm also not in Chicago (much to Patrick's chagrin). I happened upon this location whilst out and about in a lush, tropical countryside. NOW I'VE SAID TOO MUCH. Your guesses? I originally said the name of the street, which is minutes from my house, but then realized maybe that was giving it away, sorry. Hey, who got last week's right? Sorry I didn't respond sooner -- I was out of town (DURRRR), and I just updated that column with the right answer. Thanks for always playing along, JF! I really thought this one was going to be tough -- no identifiable names, numbers, features -- but you guys are ridiculously good at this. 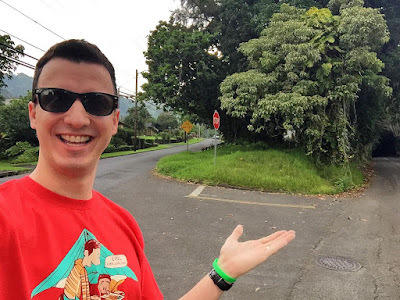 YES, this is the curve George Clooney (Matt King) runs around in The Descendants (2011), located at the intersection of Old Pali Road and Nuuanu Pali Drive in Oahu, Honolulu, Hawaii. Clooney's corner on Oahu. It's about 40 ft to your right and a few paces back.